A couple of months ago I introduced the Heart of Darkling series of maps. 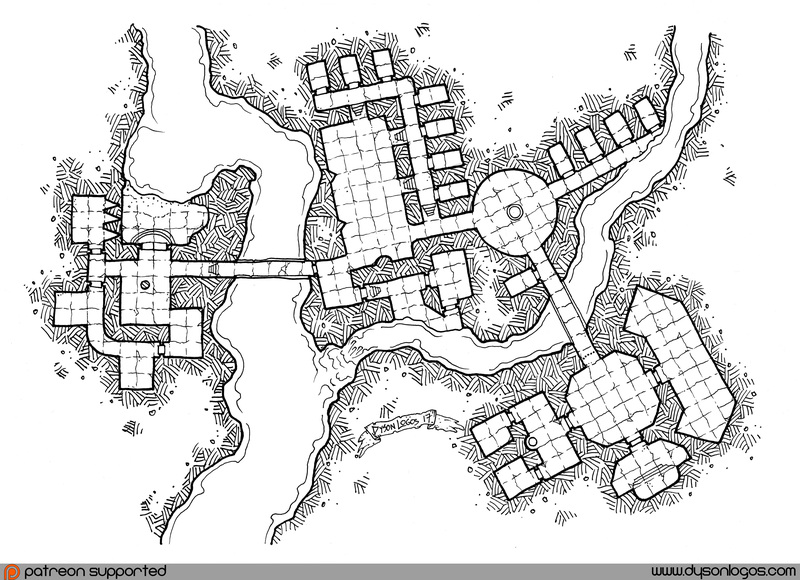 Unlike my other ongoing megadungeon (the Tekumel Undercity maps), the Heart of Darkling series is being released for commercial use as the maps are drawn. The goal of the project is to produce 20 maps that are all tied together by a single underground river and lake. Swiftwater Monastery is cut into the caves where a smaller and faster tributary of the Darkling River joins it. The monastery has a number of cells for monks in the central section, the main entry in the left section, and library, master’s chambers, and meditation room in the lower right. Each section is built around a “courtyard” with a high ceiling for training, practice and meditations. The sections are connected by bridges which pass above the two rivers – ten feet above for the one on the left over the Darkling itself, and about three feet above the Swiftwater on the right. Swiftwater Monastery was an experiment with changing the orientation of the grid and thus the orientation of the dungeon from section to section. I do like how it turned out. Is there a master map, like for the Tekumel underworld? No, because they don’t link together directly like the other megadungeon projects. There may be miles of river between locations. You could do an area map of the river with mapped locations marked. Agreed. But that will probably be near the end, when I have a good idea of what the various locations are and how they link together. As it is I’m making this up as I go.